When I went to see my oncologist, Dr. Anderson, yesterday for my 6 month check up, I was hopeful that after 2.5 years of taking the drug Tamoxifen(one-down), that I could ask to be taken off of it since almost 3 years seemed “good enough” to me. Dr. Anderson laughed at me. I was serious. “Actually, we need to switch you to an AI,”she said. She flinched. I actually saw her flinch, waiting for my response. A little like when I tell my husband how much I spent on the new couch, or the rug, or my new coat….but it was on sale…. Here I was, thinking I could see the end of the tunnel with all this medication and treatment. I had become accustomed to the side-effects of Tamoxifen–I’d settled into the hot-flashes, learned to dress around the extra 10 pounds that stubbornly clings to my mid-section, and figured I could handle this drug for 2 more years if I had to. Switch me now? To get used to a whole new set of problems? Let me explain. AI, as Dr. Anderson so coquettishly calls them, are Aramotose Inhibitors like Arimadex, Femara, Aromasin . 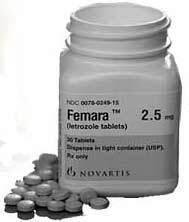 They do the same thing as Tamoxifen by blocking estrogen but supposedly they are more effective in post-menopausal woman. Am I post-menopausal? Not sure, since my speedy slide into the post-menopausal world occurred as a result of chemotherapy. Is chemical induced menopause the same thing? No idea. But Dr. Anderson seems to think that with all the new studies out now, an AI is more effective in preventing a recurrence in my cancer than Tamoxifen. “It’s only for 2 years,” she said. Again she laughed at me. I was serious. In the meantime, I have some work to do. If I am starting this God-awful drug in September than I have a busy summer ahead of me. I have been wavering about signing up for an Olympic distance triathlon (3/4 mile swim, 26.5 mile bike,6.2 run) but I think now I am just going to do it. There is one on August 27th which will give me a couple of weeks to recover from Pan Mass and most of the summer to train. I am not sure how this drug will effect me but I am not taking any chances. I may not be in competing mode for 2 years or I may be too tired to train, and after that, who knows. I may have to take a few years off. After 2 years on the AI, I will be 50–and I get to sign up for races in a whole new category the 50-55 age group. A much easier group than the 40-49 one I am presently in. Hopefully this medication will work well enough to keep the cancer at bay long enough to allow me to stick around long enough to race in the 60+ category. I am being “romanced” to switch from Tamoxifen to an AI myself. I knew about the bone, joint and excellerated aging… but heart problems to boot? Crap!!!!!!! Please keep blogging. I am a year behind you in this journey. My girlfriend is a year behind me. I am doing the Komen this summer. Nothing like your athletic endeavors, but it is so important to fight with exercise and diet. Thanks for the inspiration!